The Greek key tattoo is a popular design in both the world of tattoos and ancient Grecian design. To many in the Ancient Greek world, the pattern is rumored to have symbolized unity and the infinite power of the Greek empire. To those who choose to get the pattern tattooed on their bodies, the pattern is both aesthetic and can be rich in personal meaning. Keep reading to learn more about the Greek key tattoo design and how to incorporate it into your next tattoo. 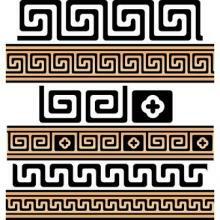 The Greek key pattern is a popular decorative border in architecture and design. Often called the Greek Fret or a meander, the patterns name is also present in Roman art. The pattern is created by a continuous line forming right angles and patterns, similar to squared waves. The waves can face either direction. It is common in moldings and borders. The pattern is usually framed by two straight lines on either side of the design. The tattoo design is thought of as a sign of continuation. Since it never ends (it just continues into itself), the design is a sign of the circle of life. Things will get hard, things will get better. Life will always repeat. 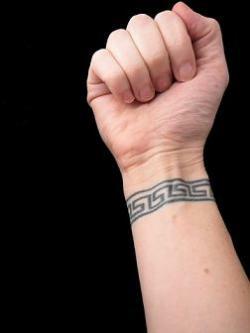 Greek key patterns are common both on their own and as part of larger tattoos. Different types of key patterns can be created or found. Sometimes the repeated and connected shapes inside the pattern will be more tightly wound or will be spread out more. Many people of Greek origin will tie in other Greek elements with the Greek key. For example, a tattoo of the Greek flag flanked by a Greek key or a phrase in Greek written inside a key pattern. As the pattern is commonly used for bordering, many people combine this idea into their tattoo by using the Greek key to frame their tattoo. Common image ideas for the center of the tattoo include pictures of Greek warriors, mythological Gods and other similar images. Many repetitive patterns mesh well together. 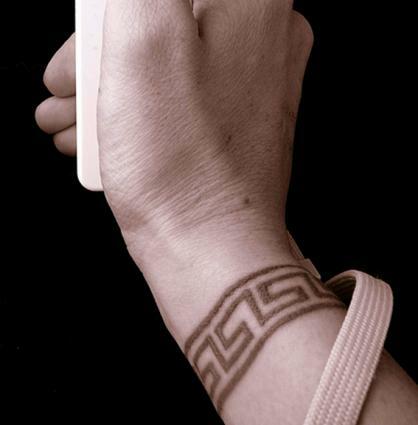 Taking a Greek key pattern and weaving it together with another similar pattern--such as a Celtic armband or knot piece--can create a stunning and unique tattoo that is catered solely to you. Speaking of Celtic tattoos, the Greek key can make a great companion to many Celtic tattoos, such as the Celtic Insignia tattoo or traditional cross pieces. It also works well with different Celtic knot pieces and the two elements can be combined to create a multi-ethnic piece. One of the simplest and elegant ideas for the Greek key is the armband. The design makes a stunning statement and can be inked with thick lines for a bolder look or thinner lines for something more feminine. As an armband, other elements can be woven in to cater the design even more, such as hearts or more geometrical designs. The design also works well for ankle bracelets or wrist bracelets. The same elements that can be altered in the armband tattoo can be used for either type of bracelet. An interesting idea would be to use the Greek key pattern to make other designs, such as a large spiral on ones back. For those looking to get belt-style tattoos tattooed around their whole midsection, the Greek key pattern may be just the thing. The pattern would work well alone or with more ornate elements added in. Because of the detailed and geometric focus in the Greek key, it is important to remember that part of the meaning the tattoo has comes from it's perfect geometric lines. If one of the lines is not completely straight or is blotchy instead of crisp, the design might not look right. Additionally, it might not have the same meaning that one would hope it has. Be considerate of this when deciding to get the piece tattooed. It is worth the effort to find a capable tattoo artist when something will be on your body for your lifetime. Some geometrically accurate designs can be found online at Tattoospot.com.